Digging thru old photos, I found two I'd made of the gravesite of my great uncle, Jesse Hardy (died in 1941). He was a fairly big landowner for the area (Buckeye, AZ, west of Phoenix), but the family couldn't waste money on a headstone. 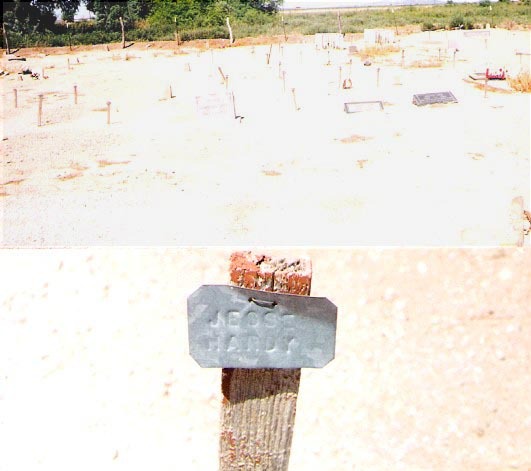 Below in the image is his marker -- a metal tag on a stick -- and above is a broader view of the cemetery where he lies -- and where the great majority of graves have the same markers. It may have been 1941, and he may have been a landowner, but these folks were living in a state that would stagger anyone below the poverty line today. Click on the thumbnail for a larger image. I can't imagine living in Arizona, New Mexico, or Texas before the advent of air conditioning. The grave marker for one of my (Civil War era) relatives is his branding iron. We tend to forget how hard things used to be and how spoiled we are. Regarding A/C, I know lots of people who lived, and still live, without it in the South and Southwest. Heck, we didn't have A/C for a long period when I was in high school. If you never had it, you didn't miss it. And in AZ, NM, and parts of TX - "at least it is a dry heat." Try the heat and humidity of the real South in August some time - it is punitive. When I was a kid, we always made the Memorial Day trip to lay flowers on the graves of my very rural ancestors. There were a lot of graves in those old cemeteries that were marked with nothing more than a long rock with one end buried in the ground or maybe a small patch of poured concrete. Around here (central Texas) there are several tiny, ancient cemeteries which have a few enormous marble tombstones. I always wondered how on earth they could have afforded such stones back then. Some of them date back to the early 1800s. If you have A/C and your house "sweats" during the daytime, you might just live in a high-humidity area.